Theodore Roosevelt was twenty-seven years old at the time. The son of a wealthy New York City family, he had grown up a sickly, asthmatic child and had occupied himself with the study of natural history. To compensate for his physical weakness he had pursued a strenuous life. In 1881, a year out of Harvard, he was elected to the New York State Assembly, where he was to become a leader of the reform Republicans. Meanwhile he was writing. 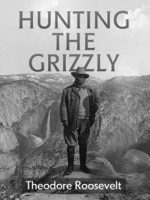 His 'The Naval War of 1812' (1882) established his professional reputation as a serious historian, and he published several books on hunting, the outdoors, and current political issues as well as frontier history. But now, with the near simultaneous death of his wife and mother, Roosevelt leaves politics behind and goes to the frontier, becoming a rancher in the Dakotas “Badlands.” On the banks of the Little Missouri, he learns to ride Western style, rope, and hunt. He rebuilds his life and begins writing about the frontier existence for Eastern magazines as well publishing three books. His description of confrontations with grizzly bears, in the following piece, make us realize that we are in the company of one of the most unusual of American presidents.